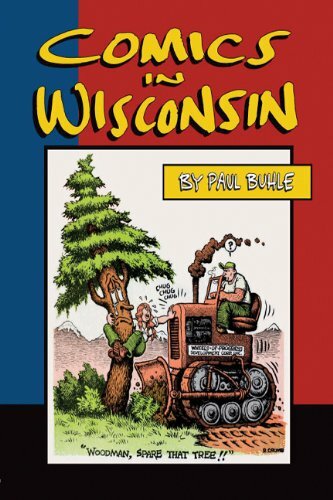 Order ‘Comics in Wisconsin’ by Paul Buhle, available from Amazon.com by clicking on the book cover above! What’s so special about Wisconsin, anyway? My home state, New Jersey, has tomatoes, Sinatra, Springsteen, Atlantic City, the Turnpike and The Sopranos. Cheese, the Green Bay Packers, cheese, comics, cheese—did I mention cheese? I’m not much of a cheese eater or a Packers fan, so—according to my notes—we’re apparently talking about comics in Wisconsin. That’s actually in capital letters—Comics in Wisconsin—as in the title of historian and activist Paul Buhle’s new book by that name. Buhle, who has written more than 40 books on pop culture so far, has documented the origins of comics in his home state. This project details the development of homegrown talents such as Denis Kitchen and connects the cheesehead dots to Robert Crumb, Lynda Barry, Bill Griffith and many more. Comics in Wisconsin was at least Buhle’s second book published in 2009: he also collaborated with his old friend Kitchen on The Art of Harvey Kurtzman.